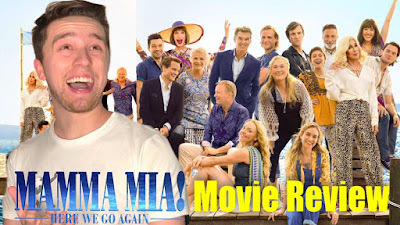 MAMMA MIA! HERE WE GO AGAIN is back with all the original cast and of course newcomers. Directed by Ol Parker this film tells the story of Sophie (Amanda Seyfried) who is just about to open a brand new hotel while at the same time dealing with some family issues. With the story flashing back to a younger version of Streep’s Character from the first one played by Lily James , who might I say was perfect casting. These flashbacks tells how she met all the three great dads who once again get younger versions of themselves. (which are all spot on great performances) Now full disclosure I am not the biggest fan of musicals and even the first Mamma Mia film, I find it to be fun and enjoyable with some awesome and memorable music, but nothing that has made me fall in love and become a Mamma Mia fanatic like my sister, who loved this sequel and thinks its right up there with the original. For me though I found the film to lack and felt like two stories and scripts were pushed together. With one being like a prequel to the original film and one being a sequel to the original one. It never felt like the story meshed right for me and I found myself intrigued in more of the flashbacks then what was actually going on in the current timeline. I know this is musical, but I judge all films on one thing and that is entertainment and enjoyability. One of the main things for me that I get out of those things is having at least either a decent story and for me it just felt like a mess of a story. Where the studio couldn’t decide to make one or the other script and or didn’t know what to put into those scripts to make them full feature films so they combined them to hit a run time that takes forever to get too. Now if for some reason you’re still reading this and not wanting to kill me with a pitch fork let me say my positives, I enjoyed the film for what it was I just expected a little bit more from it, the music is fantastic once again and it got me toe tapping and swaying my body in my seat to it. The set design feels like a broadway musical and so do the dance numbers. The performances are all great. Plus it seemed like everyone was having fun. Meryl Streep does have a glorified cameo in here so if she's the reason you’re going be a little weary of that. Seyfried and James do really steal the show as a whole and I can’t help wish they would of just made a prequel about Streep’s younger character with Lily James playing her. If you’re a fan of the original you’re gonna love this one, if you’re not and someone drags you to it you’ll enjoy yourself you’ll just find yourself not wanting to see the film ever again. For more views on this film check out my video review down below.